Thank you for looking at my page. Authentic item Condition:New Brand:Kiban Honten Frame color: white, black, walnut, maple Size: 16 x 4 x 12.5cm (6.3 x 1.7 x 4.9) Functions: clock, calendar, shuffle, cross-fade Nixie tubes NL-807 Back-up function (clock display function continues even with no power) 5V, USB Instructions: Japanese. Thank you for your seeing our products. We try to describe any items to the best ability and offer you the best values and an good quality. We specialize in Japanese tradition products, so please look at our other items and enjoy feeling Japanese culture! It is our pleasure to provide high-quality Japanese products to the world. We can provide all kinds of items. Please send a fun life by a Japanese goods! If I can be your further assistance, please do no hesitate to contact me. We try our best to send it to you!! 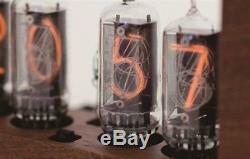 The item "NEW Kiban Honten Desk Clock Nixie Tube Clock-Cold cathode display From Japan F/S" is in sale since Wednesday, June 29, 2016. This item is in the category "Home & Garden\Home Décor\Clocks\Desk, Mantel & Shelf Clocks". The seller is "jatoyo*" and is located in Kumamoto. This item can be shipped to United States, all countries in Europe, all countries in continental Asia, Canada, Mexico, Australia.